A global producer of cement, ready-mixed concrete, aggregates and related products has completed a significant upgrade to its bulk material handling conveyors, helping the company eliminate waste and reduce maintenance, while minimizing potential risks from airborne dust and fugitive material build-up. By avoiding accumulations that required cleanup, the company is also reducing the need for maintenance personnel to work in close proximity to fast-moving conveyors, helping further diminish the chance of accident or injury. Grupo Cementos de Chihuahua (GCC) is a global producer of cement, ready-mixed concrete, aggregates and related products to construction industries in Mexico, the United States and Bolivia. The company began manufacturing operations in 1943, with a capacity of just 60,000 metric tonnes. Expanding gradually according to a clear strategic vision, the firm has developed innovative processes and technologies that contribute to dynamic growth, while fostering an environmentally responsible, community-oriented culture. Like most cement manufacturing sites, GCC Dakotah employs an extensive conveyor system to handle raw materials and move finished product. In keeping with its long-range plans to employ industry best practices for bulk handling and fugitive material control in its plants, company officials conducted an extensive assessment of the conveyors in early 2013. It was determined that significant upgrades could be made on conveyor transfer points to reduce spillage and dust emissions, and they contacted Martin Engineering for a proposal. The upgrade involved a significant overhaul of six transfer points on four conveyors, which were originally constructed in the late 1970s. All belts are 24 inches (61cm) wide, and range in length from 40 feet (12.2 metres) to 110 feet (33.5 metres). During normal operation, they move 200–250tph (tonnes per hour) of clinker from the storage building and carry it to the bins feeding the finish mills. With a detailed proposal from Martin Engineering in hand, GCC planned the upgrade process for a scheduled shutdown in March. In addition to supplying the components, Martin Engineering was responsible for planning and supervision of the project, while a mechanical contracting group assisted with the installation. Work began on all four conveyors by disconnecting the material inlet chutes from the existing skirtboard system and removing the worn rubber skirt seals, clamps, supports, skirtboard chute walls and tail boxes. Existing idlers were also removed to allow mounting of new belt support systems and troughing roll assemblies. On each conveyor, three Martin® Trac-MountTM Idlers were installed, spaced to deliver optimum belt support. The unique idler design delivers proper belt carriage, while stabilizing the belt line to improve sealing. Its slim profile requires only eight inches (203mm) of space for 6-inch (152mm) idlers, and the slide-in/ slide-out frames allow service without the need to raise the belt or remove adjacent idlers. With new idlers and troughing roll assemblies in place, each transfer point received one new impact cradle and two belt support cradles. Installed under the loadingzone, Martin® Impact Cradles absorb the force of falling material in a transfer point and stabilize the belt line to help prevent the escape of dust and fines. Rugged impact bars are composed of a top layer of low-friction, ultra-high molecular weight (UHMW) polymer and a lower layer of energy-absorbing styrene butadiene rubber (SBR). Working in conjunction with the impact cradles are a pair of Martin® Slider Cradles on each conveyor. Installed under the skirtboard of the transfer point, these cradles support the edges of the belt specifically to eliminate sagging. With the proper support in place, pinch points that can trap material and gouge the belts are eliminated, improving both sealing efficiency and belt life. When the top eventually wears out, the bars can simply be flipped over to provide a second wear surface. Sixteen-foot sections of skirt board were installed on each transfer point, with new side/centre supports and covers. The new skirt board is 7′′ (17.8 cm) high on two of the conveyors, and 12′′ (30.5 cm) high on the other two. Each system also included internal skirt board wear liners and a new tail box assembly with sealing components. To deliver positive containment of fugitive dust, each transfer point was outfitted with Martin® ApronSealTM Skirting, a dual design with two sealing surfaces. A primary seal is clamped to the steel skirt board to keep lumps on the belt, and a secondary seal or ‘outrigger’ strip captures any fines or dust particles that may pass beneath the primary seal. The secondary seal lies gently on the belt and self-adjusts to maintain consistent strip-to-belt pressure, despite high-speed material movement and fluctuations in the belt’s line of travel. 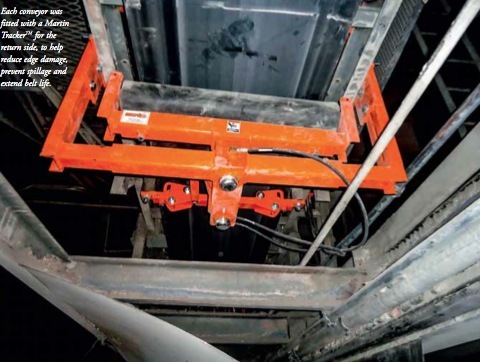 Each conveyor was then fitted with a Martin® TrackerTM for the return side, installed approximately 10 feet (3 metres) ahead of the tail pulley. By providing immediate and continuous precision adjustment of the belts, the Tracker helps reduce edge damage, prevent spillage and extend belt life. cleaning performance immediately, avoiding any break-in period, the assembly maintains consistent tension without frequent adjustment. The entire upgrade operation was completed in just 11 days during the scheduled outage, with crews working 12-hour days to accommodate the planned shutdown. While specific cost savings are difficult to quantify, Denoski said the difference is easily observed. “The production team responsible for that area has had nothing but positive feedback about the upgrades,” he commented. “We’re not losing product to spillage and dust, so that material can be sold instead of cleaned up off the floor. The manpower formerly spent on cleanup can now be directed to core business activities. Martin Engineering supplies conveyor products and industrial vibrators around the world for a wide variety of bulk material handling applications, including cement/clinker, rock/aggregate, coal, biomass, grain and other materials. Founded in 1944, Martin Engineering is a major force in making bulk materials handling cleaner, safer and more productive. The firm is headquartered in Neponset, IL, offering manufacturing, sales and service from factory-owned business units in Brazil, China, France, Germany, Indonesia, Mexico, South Africa,Turkey, India and the UK, and under exclusive licence with ESS Australia.